If an unclassified email leaked by WikiLeaks is any indication, it appears that there may be much more to the story of what happened to Hillary Clinton back in 2012. We’ve been told that she suffered a concussion… but was that just diplomatic cover for something else? Bill Clinton did more today than defend his wife, Hillary Clinton, from recent accusations leveled by GOP strategist Karl Rove that she suffered brain damage after falling in December 2012. The alleged incident claimed in this story overlapped with Hillary’s admitted illness, concussion and time off from office that precipitated her resignation as Secretary of State less than two months later on February 1, 2013. Wikileaks released this chain of emails forwarded between various ranking military officials, and eventually to State Dept. 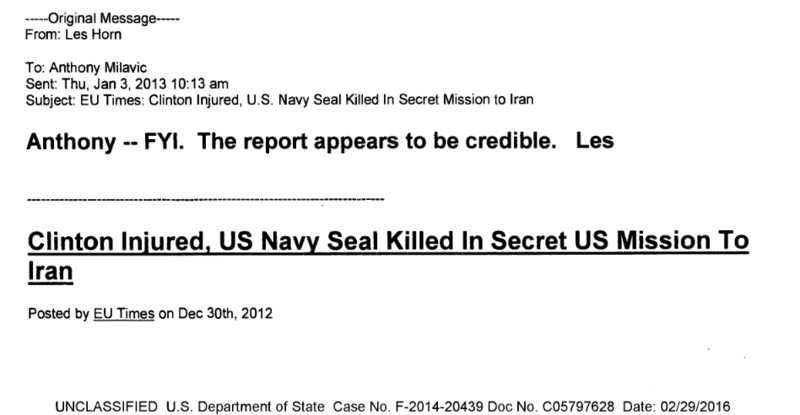 and top Hillary confidant Jake J. Sullivan who laughed it off when he forwarded it to “H” herself, citing a conspiracy story written by Sorcha Faal – whose reports are widely dismissed as disinfo – claiming that Hillary sustained serious injuries in a crash during a secret diplomatic meeting with the then-president of Iran. If such a secret meeting did happen, it remains top secret and there is no publicly available information to confirm or deny that such a meeting even took place – let alone that there was a plane crash. However, Capt Les Horn, USN (Ret), who was in the chain of emails, noted that “The report appears to be credible” in a message he sent to Anthony Milavic, a retired Marine major. Presumably his assessment is based upon detailed military knowledge of the circumstances under which such a secret diplomatic mission would have taken place, including details about the aircraft and route, and possibly includes first hand knowledge of events. But that remains unclear. 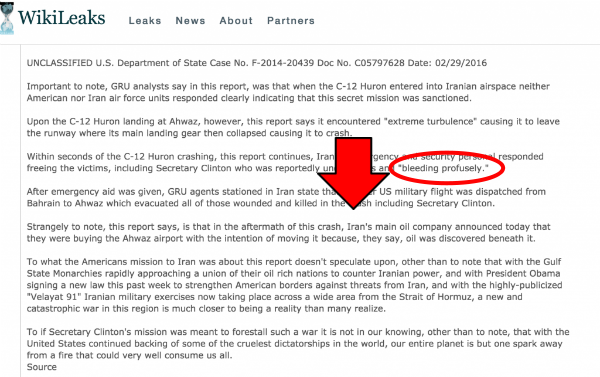 A new Foreign Military Intelligence (GRU) report circulating in the Kremlin today is saying that United States Secretary of State Hillary Clinton was injured, and a top US Navy Seal Commander killed when their C-12 Huron military passenger and transport aircraft crash landed nearly 3 weeks ago in the Iranian city of Ahvaz near the Iraqi border. Upon the C-12 Huron landing at Ahwaz, however, this report says it encountered “extreme turbulence” causing it to leave the runway where its main landing gear then collapsed causing it to crash. The death of SEAL Team 4 Commanding Officer Job W. Price adds additional reason to think that a cover story may be at work. Price was reportedly escorting Hillary on the plane, and may have died as a result of injuries in the alleged crash. The US Navy Seal member reported killed in this bizarre incident, this report says, was indentified as Commander Job W. Price who as a leader of this highly specialized American Special Forces unit protects high-ranking diplomats traveling in Middle Eastern and Asian combat zones. This GRU report, however, states that US military flight logs recorded by Russian air and space forces confirm that Commander Price, and other members of US Navy Seal Team 4, left their base in Urozgan Province, Afghanistan on a flight to US Naval Support Activity Bahrain where they met up with Secretary Clinton and all of them transferred to the C-12 Huron that began a flight path to Baghdad, Iraq. However, officially Commander Price died by suicide a.k.a. a “non-combat-related injury” on December 22, 2012 while stationed in Uruzgan Province in Afghanistan. Was this official explanation just cover for the real cause of his death? What else don’t we know? Here’s the full story as released by Wikileaks. The PDF can be downloaded from Wikileaks here.